10/29/07, The Dakota: Tenor saxophonist David Sanchez came to the Dakota for one night only, after two nights at Andy's in Chicago. Sanchez is exciting to hear and watch; he's intense, focused, and (not to be shallow, but it's true) he looks good. The week before, he had played in New York with a sextet: Lage Lund on guitar, Hans Glawischnig on bass, Robert Rodriguez on piano, Pernell Saturnino on percussion, Henry Cole on drums. He came to the Dakota with a quartet: Lund, Glawischnig, Cole. Sanchez is a member of the new generation of jazz musicians: educated, focused, savvy, honored, and skilled at making his way. Having just come from my Jazz 101: Bebop class, I'm struck by the many contrasts between Charlie Parker's life and Sanchez's. Parker: had his first music lesson in the Kansas City public schools, started playing alto sax at 13, largely self-taught (by listening to older musicians and playing in competitive jam sessions), addictions to heroin and alcohol, nervous breakdown, suicide attempts, dead at 35. 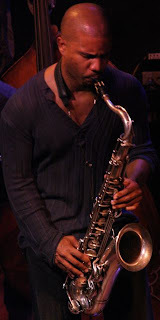 Sanchez: started playing percussion at age 8, formal education in music (prestigious music school in San Juan, scholarship to Rutgers), mentored by Dizzy Gillespie, signed to Columbia, grants and commissions for composing, college and university gigs as Artist-in-Residence and visiting professor, Downbeat Readers' Poll Top Ten Tenor Sax Players, Latin Grammy award, just signed to Concord (where everyone who's anyone in jazz seems to be going). At 39, Sanchez is four years older than Parker was when he died, but still very young, and he seems to be staying out of trouble. We can probably look forward to many years of watching him evolve and grow as a musician. The quartet played selections from Sanchez's latest composition, "La Leyenda del Canaveral" (The Legend of the Cane Plantation), based on a poem written by one of his sisters. Their version of "Monk's Mood" began on guitar, a new sound for Sanchez. They alternated between ballads and ferocious grooves, and what stitched it all together was Sanchez's already famous tone, clear and beautiful and even. Sanchez didn't talk much, but he ended the evening with a brief spoken benediction that sent us out into the night: "Music is bigger than us—is sky, water, world—is the solution to so many things."